Home » Blog » News » Pie Season, etc. It’s been a little while since I made an entry. I’ve been busy writing…working on several projects…but the one taking up most of my time right now is the second book in the “Storm Runners” series. The first novel of the 3 part series will be out in 2011. Odd to be working on a book about a hurricane, looking out the window at the beautiful Oregon weather. Today marks the official start of blue ribbon Pie Season. 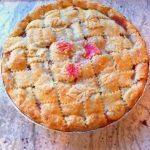 Marie is busy down the hall in the kitchen putting together and baking 3 pies for the Clackamas County Fair. We’ll run them over via car and ferry this afternoon. It’s a yearly tragedy. I don’t get to eat any of the pies (or even taste them). I do get to smell them though as I work in my office and on the drive. The pies are judged tomorrow, but we won’t find out how Marie fares until Tuesday when the fair opens, or maybe not even then, as we will be winging our way to Arkansas, leaving the farm in the care of S&K for a few days.